Store-bought Nerf guns can be simple, and sometimes boring. Bright orange details aren’t the best when you’re trying to hide from your brother. A bright blue rapid-fire style gun doesn’t feel very fitting for a cowboy. It’s great for holding all your ammo, but what if you want it to look different? 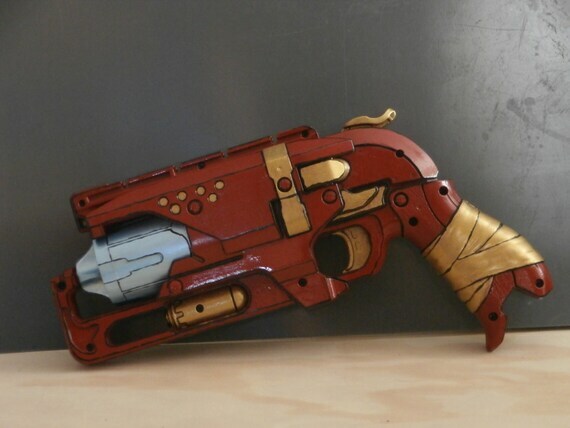 Your imagination would work, but how about an amazing hand painted gun that looks just the way you imagine? Here are 7 amazing sellers on Etsy who sell just that. AquativeDesign takes average Nerf weapons to a whole new level. Leaving features like Laser Systems and Bow and Arrow mechanisms intact, this seller beautifully enhances weapons with metallic paints for exciting battles! They take custom orders, and specialize in holsters to store your favorite weapons. TheSassyCrafter94: Creating stunning Disney-inspired prop guns, she beautifully paints non-firing guns with genius themes, such as a redone Tinkerbell Bigshot Blaster sparkling with pixie dust and rhinestones. This seller’s N-strike Elite Crossbolt Blaster gets a twist with queen-worthy gem detailing, but dangerous-looking black and red studs accent the gun, making “off with her head” easier than ever. Custom hand-painted Nerfs- it couldn’t get better! Offering both beauty and functionality, DreemwvrCreation will make you the weapon of your dreams. She paints intricate patterns, battle-marred details, faux-wood accents and more on any Nerf. The best part? They still shoot! 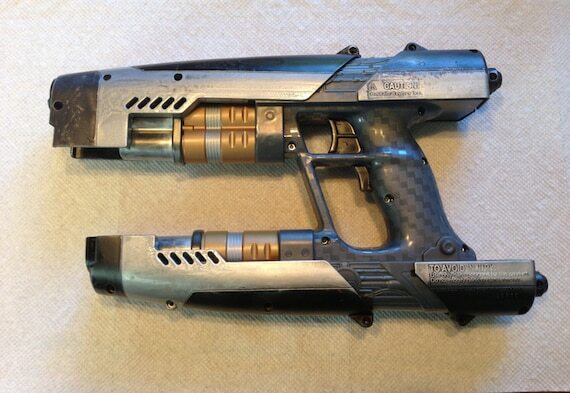 CstutzCostumes sold a Nerf-Starlord Blaster with a battle worn look and sheen. Cstutz can take an incredible weapon and make it even better, with attention to detail and accuracy. 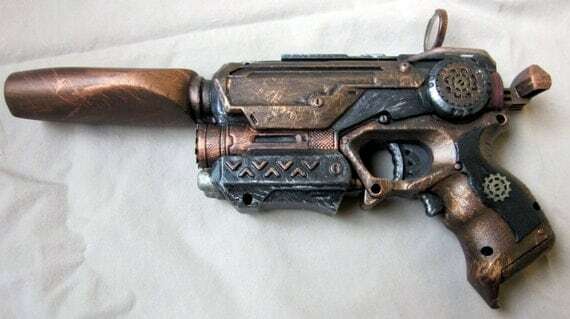 The functioning renovated blaster is just what you need for your next cosplay event. 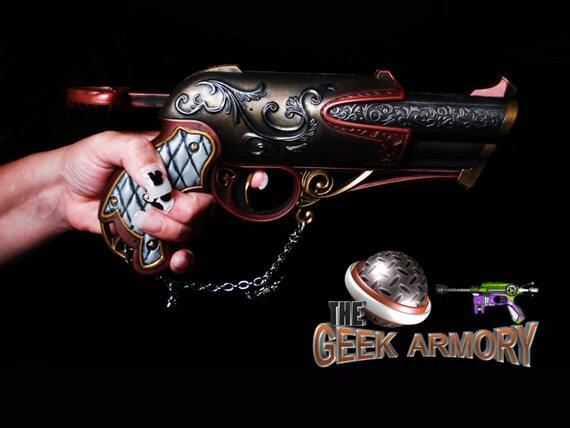 With raving reviews, TheGeekArmory makes fully-functioning, made-to-order weapons at incredible prices. Offering over 80 different Nerf weapons to choose from, TheGeekArmory sells incredible, immaculate quality at great prices. New Etsy seller Brigada offers beautiful girly Nerf guns- powerful blasters in dark pink and black, or a lilac and silver option. Putting an end to the boyish neon-orange, Brigada sells pretty guns for a change, and at a good price too. Arewethebaddies: Shipping stunningly real-looking gun from the coast of central England, the guns are well-researched and look very authentic. They fire just like the guns you’d find at a store, only the intricate detailing makes them fit for a Victorian gentleman. Made to look like an officer’s pistol, they have really beautiful detailing- down to a faux cloth-wrapped, worn red leather, or antique-looking faded wooden hand-grip, or a brass colored top slide on the Mega-Magnus Blaster. 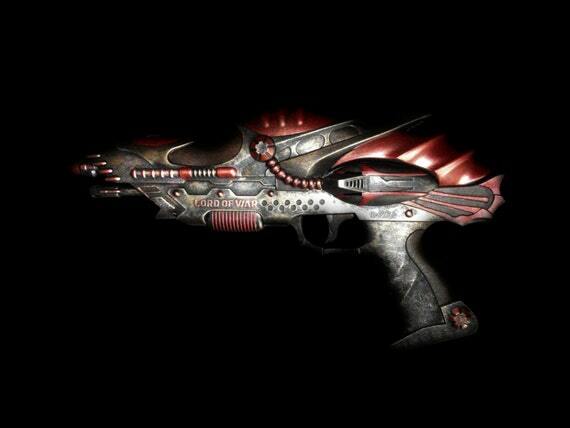 Arewethebaddies also updates modern-looking weapons, such as a late 1920’s semi-automatic Nerf gun. Painted with details that make it look incredibly real, you’ll want to own every gun Arewethebaddies, and all the other Etsy sellers, has to offer! Want more? 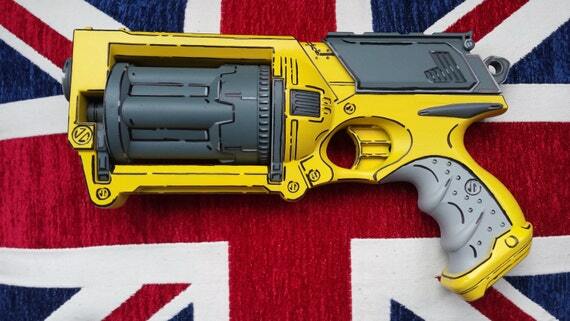 Check out these Borderlands inspired blasters.